Viburnum dilatatum is a common shrub in the lowlands and foothills of mountains in Japan, China and South Korea. The leaves are shaped like those of a lime tree (Tilia species), with conspicuous parallel veins, and often turn red or purple in the autumn. The berries are slightly elongated, with a dark spot (the remains of the flower) at the tip. Both red-fruited and yellow-fruited forms are cultivated. Linden viburnum is a large shrub with neat, round leaves and flat heads of small white flowers followed by red, or sometimes yellow, fleshy berries. 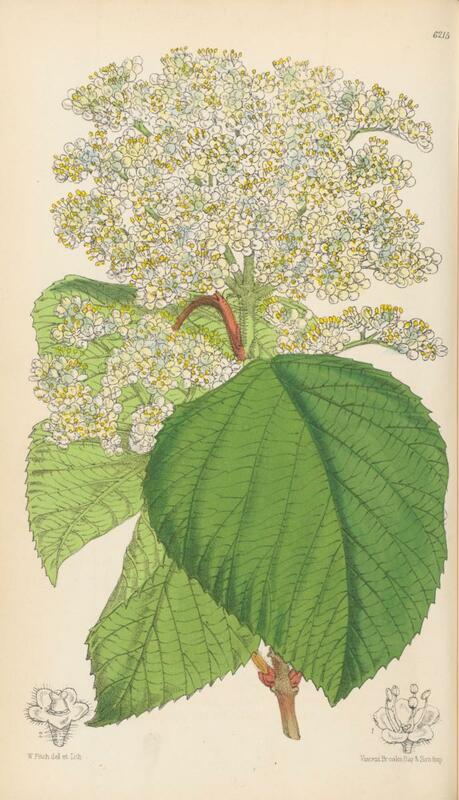 Linden viburnum was introduced into cultivation in Europe from Japan in 1875. 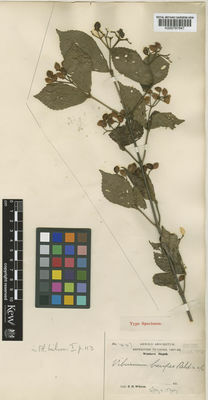 It is more commonly cultivated in North America, where several cultivars have been selected. Native to Japan and northern China. Overview: Linden viburnum is a branching shrub growing up to 3 m tall. Leaves: The leaves, which are held opposite each other on the stem, are broadly ovate or egg-shaped, finely and evenly toothed, 3-12 cm long and 2-8 cm wide. The leaves have around seven pairs of parallel veins, the lower pairs branching again, and are often purplish in spring, turning red or purple in autumn. Flowers: The small, pure-white flowers are borne in flat or slightly rounded heads. 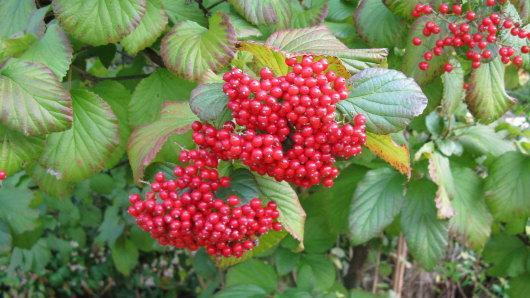 Fruits: The berries are ovoid, about 5 mm long and are red (or yellow in the form Viburnum dilatatum f. xanthocarpum ). There is no indication that Viburnum dilatatum is threatened in the wild. It is commonly cultivated in North America. Samples of V. dilatatum seeds have been stored in Kew's Millennium Seed Bank as an ex situ conservation measure. 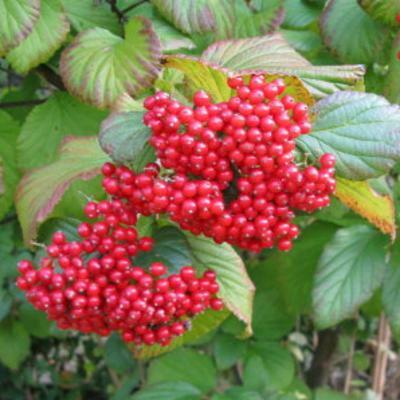 Popular as an ornamental for shrubberies, windbreaks or light shade in open woodland, linden viburnum is grown particularly for its colourful berries in the autumn. The leaves, stems and berries are used in traditional Chinese medicine. The berries are cooked to make a soup used in the treatment of snake bite, dysentery and as a vermifuge. Linden viburnum can be grown easily in good soil with reasonable drainage. 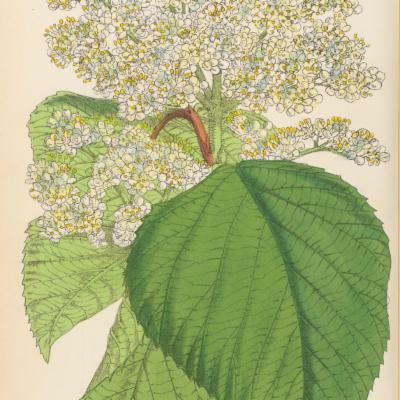 Other viburnums such as Viburnum opulus (guelder rose) tolerate waterlogged soil. Viburnum dilatatum is grown in the area between the Palm House and King William's Temple at Kew. At Wakehurst, V. dilatatum can be seen growing on the slope above the study centre in Westwood Valley. Preserved specimens of V. dilatatum are held in the Herbarium, one of the behind-the-scenes areas of Kew. The details of one of these can be seen online in the Herbarium Catalogue. The Economic Botany Collection contains samples of leaves and wood from V. dilatatum , which are available to researchers by appointment. Scrub on hills and low mountains. Not evaluated according to IUCN Red List criteria, but not considered to be at risk in the wild. Raw berries inedible; cooked berries edible but best avoided. Birds are slow to eat them in winter. Viburnum dilatatum var. litorale Konta & Katsuy. The Plant List, Version 1 (2010). Viburnum dilatatum. Zhong Guo Yao Cai Gong Si (Chinese Herbal Materia Medica State Company) (1994). Synopsis of Traditional Chinese Medicine Resources. Traditional Chinese Medica Resource Series, Science Press. Anon (1985). Woody Plants of Japan (illustrated). Yama-kai, Tokyo, Japan. Duke, J.A. & Ayensu, E.S. (1985). Medicinal plants of China, Vol. 1. Reference Publications, Algonac, Michigan. Bean, W. J. (1980). Trees and Shrubs Hardy in the British Isles (8th edition revised). John Murray, London.